These men who were then all around him, had black faces, black hands, black clothes on -- were black all over! They had little black noses, and this Innuit was very alarmed because he could not get away from these black men, but especially he was frightened when they made three great noises [three rounds of cheers as Too-koo-li-too thinks these great noises were]. Tookoolito -- whose Inuktitut name is conjecturally sometimes given as Taqulittuq -- was born in the Cumberland Sound area around 1838. In 1852, no more than fifteen years old, Tookoolito was brought to England by wine merchant Thomas Bowlby, who had taken an interest in missionary work among the Inuit. 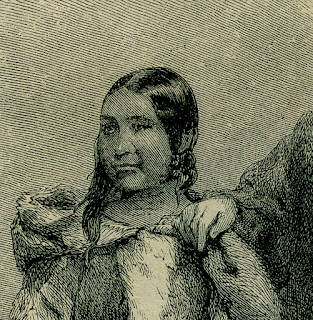 With her came her husband Ebierbing ("Joe"), along with Akulukjuk (referred to as "Harlukjoe"), an unrelated seven-year-old whom some at the time assumed was their son. Bowlby exhibited the group at a number of locations, and was even able to arrange a meeting with Queen Victoria, which took place on February 3rd 1853. The young Queen was impressed by the meeting, remarking in her journal, "They are my subjects, very curious, & quite different to any of the southern or African tribes, having very flat round faces, with a Mongolian shape of eyes, a fair skin, & jet black hair. They are entirely clothed in skins." Too-koo, for her part, recalled that she "liked the appearance of Her Majesty, and every thing about the place." Unlike some of the unscrupulous men who lured Inuit away to be shown abroad, Bowlby was as good as his word, returning Tookoolito and Ebierbing to their home. Over the years that followed, their familiarity with English language and customs led to working with some of the whaling crews that wintered in Cumberland Sound, and it was there that Charles Francis Hall encountered them. He'd heard something of them from his friend Sydney O. Budington, and on meeting them, secured their services as guide and translator. They assisted him in his researches around Frobisher bay, and returned with him to the United States afterwards. Hall, well-meaning but unwise, leant them and their young child out for shows at Barnum's Museum and Boston's Aquarial Gardens, as well as bringing them along on his lecture tour, where he sought to raise funds for his return. Very likely as a result, Hannah's son, little Butterfly, became ill and died, and she herself nearly died of grief. And yet, nursed back to health by Mrs. Budington, Hannah returned along with Joe to serve Hall on his next, longer Arctic search, the one which finally brought him to the shores of King William Island. During that journey, Tookoolito gave birth to another son, whom Hall christened "King William," but who died not long afterwards. In what might have been a sort of compassionate gesture, Hall traded a sled and some other valuables for a young girl whom Hannah and Joe called simply Panik (daughter), or Punny. After Hall finally gave up on his mission of finding Franklin survivors and organized the Polaris expedition in search of the North Pole, the whole family came with him, only to suffer the privations and uncertainty of drifting south on an ice-island after Hall was murdered and the party lost contact with their ship. Thanks in large part to Joe's hunting skills, the group survived long enough to be rescued, and he and Hannah both testified at the inquest into Hall's death. They believed Hall when he told them he had been poisoned, but unfortunately the Board of Inquiry gave more credence to the testimony of the white ship's crew and scientists, and the likely murderer, Dr. Emil Bessels, was never charged. Hannah and Joe moved to Groton and lived in a home not far from the Budingtons, from which, Joe noted proudly in a letter, "Punny go to school every day." Alas, it was not to last; Punny died in 1874 and Hannah followed her in 1876; they are buried next to one another in the Star Cemetery in Groton, where I've often visited them. There was, in her day, no farther-faring Inuk than Tookoolito, along with her lifelong partner Ebierbing; without her work, none of the detailed Inuit testimony sought by Hall would ever have been collected -- evidence which made the discovery of "Erebus" and "Terror" possible. And yet, at least as of now, Too-koo has never received the sort of recognition her work deserves. Her name was mentioned as a candidate for a woman to appear on Canadian currency, and a couple of years ago there was a Kickstarter campaign for a play about her life, to be written and staged by Reneltta Arluk. It's to be hoped that it will be presented someday, and will not be the last remembrance of this remarkable woman.